Because who doesn't need another tie! I found a picture of a tie like this in a magazine online and I thought it was really cool so I thought I would make it and since my alternative choice was doing french homework I started right then. This took alot of ironing and alot of me cursing at my eyelets. They are now my least favourite thing to deal with. Again no pics sorry. Alright so get one of your favourite ties and a very long piece of fabric. Lay out your fabric and lay the tie on top of it. 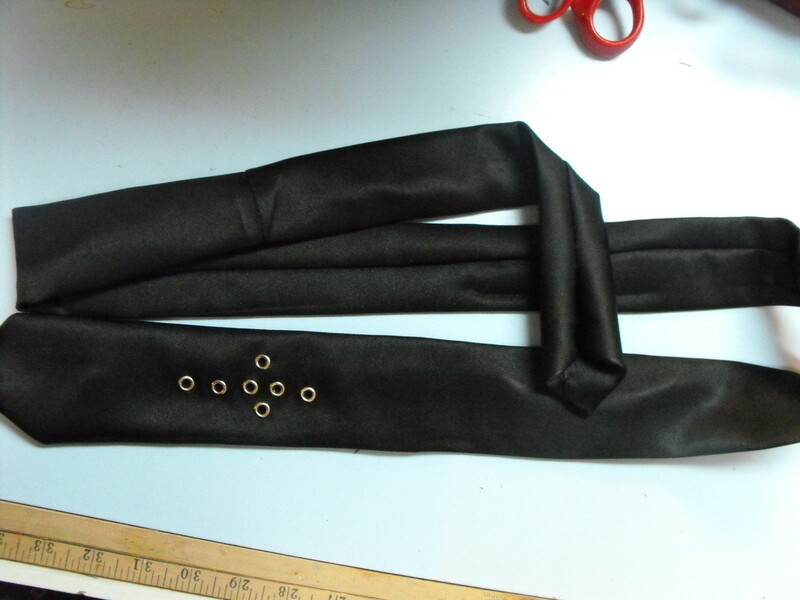 Chalk the outline of your tie onto the fabric. Leave just OVER half of the width of your tie on either side of the chalk outline and cut. Fold the two ends so that they get the triangle point at eh end. Fold down one corner, then fold the other on top and pin in place. You are pinning so that the good side is in. Fold the fabric in half lengthwide and pin every so often down the way. I ironed it after this step to make sewing it easier but it's by your preference. Sew along the edge where you folded the fabric together. Flip the tie right side out. 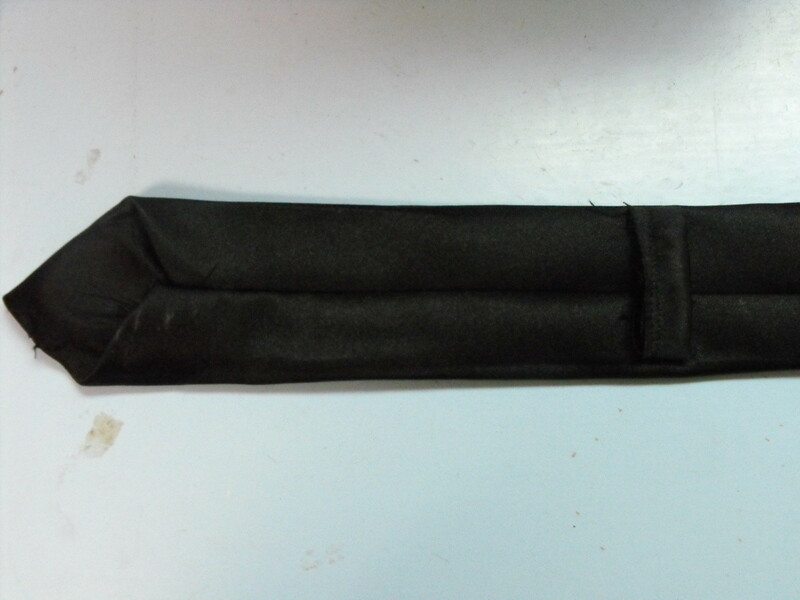 Take one of the two ends and unpin it and fold it back the other way so that the good side is now out. Sew the corner down so it doesn't come apart. Repeat on the other end. Iron it down so the the seam you made when you sewed it in half runs down the middle of the back of your tie. Arrange the eyelets in the shape you want and mark it down on the tie. You can do this next part one of 2 ways. Either cut the hole for the eyelet, push it through and then bunch up the fabric on the back so you can hammer the eyelet closed. Or you can undo a few of the stitches in the back so you have a clear view of the eyelet backs. When you're done sew it back up by turning that end inside out again. Cut a small skinny piece of fabric. Fold it over lengthwise and sew right down the middle of it. You are going to use this piece to keep the tail of your tie from flying all over the place. 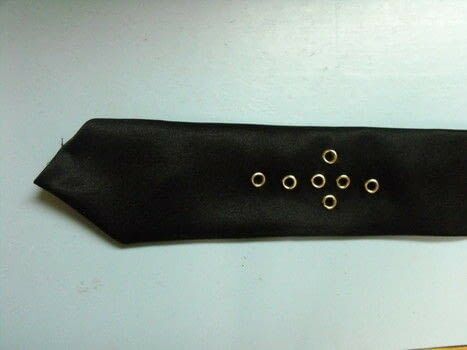 (It's the little bridge in the second pictue) Sew this piece in a bridge on the back of your tie close to the eyelet design. This is where you stick the other oend of the tie when you put it on. I don't describe things well so if you have any questions just comment and I'll try to help.